This open-source app is an experiment in Captology and Machine-driven behaviour change. It provides a gentle nudge to the user to go to bed at a reasonable hour (being an infovore, this is an issue that I suffer from). 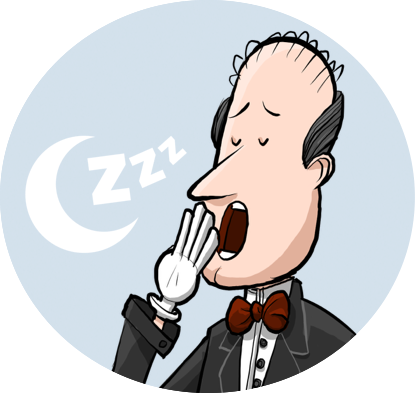 Beddy Butler is a virtual butler in your ear who reminds you to go to bed, e.g. "It's getting rather late, your Grace", at a timeframe of your choice. 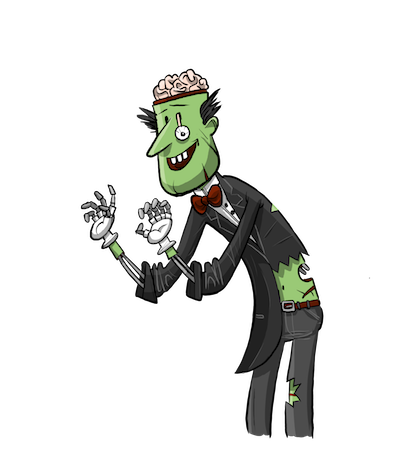 In fact, there are 3 sets of voices, from shy and retiring, to insistent and preachy, to a zombie butler. I did the butler voices myself (! ), recorded with a made-to-order Mitra 3D Mic Pro, specially imported from India, so that it sounds like someone is really over your shoulder. It was then heavily pitch-shifted to make my voice sound like an old man. Props and sincere thanks to David Garces for profound help with the arcane and pointerless Swift, Livio Perissin for the awesome character graphics, Jeroen Muller for uncanny pitch shifting, and Abe Gong for the original inspiration, after I saw one of his talks at a Salon hosted by Alton Sun. It might get it ported to Windows/*nix/Android if there's sufficient interest. It's a pretty hideous little app made just for my own ridiculous satisfaction, but the world has many diverse tastes. Download it now off iTunes. Or, why not fork it and record your own, as I've released it open-source (BSD license). Want to get a closer look at what goes on inside my head? Now you can! I had a Full Body MRI taken at the Centre for Neuroimaging Sciences courtesy of Klarismo. To help stimulate interest in digital medicine, a passion of mine, I'm distributing my head data for anyone who is curious. You can download the files here, one of just my brain, and one of my head (including brain). They can be easily viewed using MRIcroGL or similar DICOM viewers. Here is a Canvas of the space of Cognitive Science that I constructed with the aid of my machine intelligence students at the Exosphere Academy. I use this infographic as a way to quickly explain the disruptive power of machine intelligence within a very broad range of industries, some of them considered rather traditional. Freely distributable, please share and disseminate as you wish. This tool can help fix many problems in five minutes or less. The 1994 game System Shock (by the ingenious Warren Spector) greatly inspired me as a kid, almost as much as Sid Meier’s Alpha Centauri. The plot involves a hacker messing around with ethical constraints on an A.I. on behalf of a corrupt corporate officer, which definitely lead me to start thinking about Machine Ethics (and eventually EthicsNet) from an early age. It was amazing to hear that 24 years after the game’s original release the first Fan Mission was being developed by Joey Lansing. I am honored to contribute my voice to various audio logs telling the backstory of this groundbreaking game that blew my mind so much as a child. If anyone can use a discount SHODAN, let me know!